We design tank barges for your cargo, tow, and the most ideal equipment layout. Tow conditions, the cargo, its hand- ling, your entire shipping operation, affect a tank barge's efficiency. We design and build each barge to your specifications and operating require- ments, so it works harder and longer than standard design, assembly-line barges. For salt water operation, specify the pumps and mechanical equipment on the stern, to minimize corrosion from salt spray. Most shipyards put this equipment only on the bow, because they're locked into one mass produc- tion procedure. But HBC Barge isn't locked in. 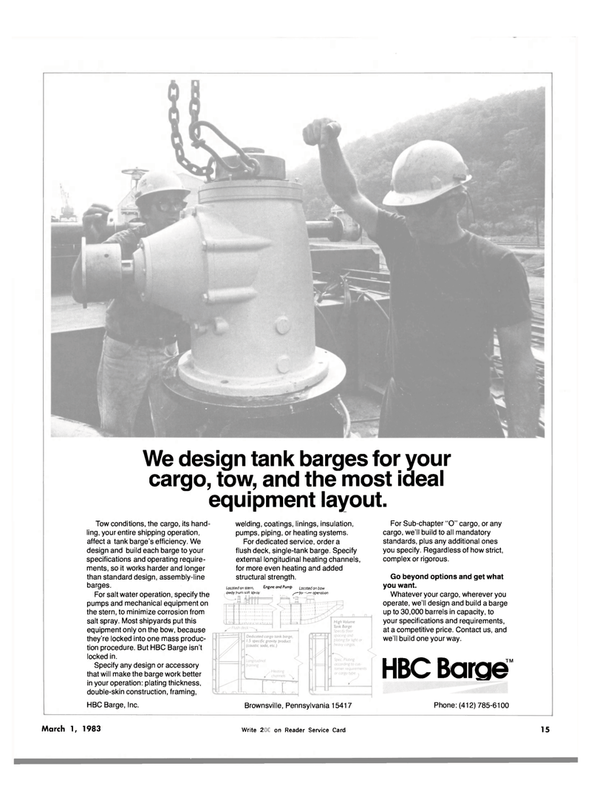 HBC Barge, Inc. welding, coatings, linings, insulation, pumps, piping, or heating systems. For dedicated service, order a flush deck, single-tank barge. Specify external longitudinal heating channels, for more even heating and added structural strength. For Sub-chapter "O" cargo, or any cargo, we'll build to all mandatory standards, plus any additional ones you specify. Regardless of how strict, complex or rigorous. Whatever your cargo, wherever you operate, we'll design and build a barge up to 30,000 barrels in capacity, to your specifications and requirements, at a competitive price. Contact us, and we'll build one your way. Pennsylvania mechanical equipment HBC Barge Inc.